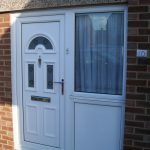 Do you offer UPVC Front Door Repairs? 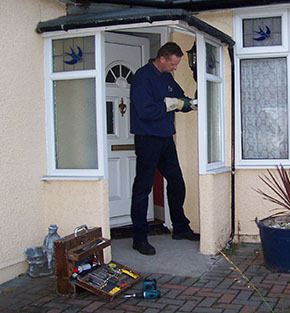 Yes, we offer UPVC Front Door Repairs at fixed prices, including door adjustments & lock changes. My door multi point lock has broken. Do I need a new door? No, most times the multi-lock can be renewed regardless of the age on the UPVC door. Why are my door handles really stiff to operate? Although your door handles are stiff, the most likely cause would be a misaligned door. The door bounces back open when I close it unless I lift the handle to keep it shut? This could be due to either the latch part of the lock not working or the door being misaligned. My door handles are loose wobbly floppy stiff or notchy? The problem with loose wobbly floppy handles could be due to lack of lubrication, worn handles, as well as a broken springs or a faulty lock. 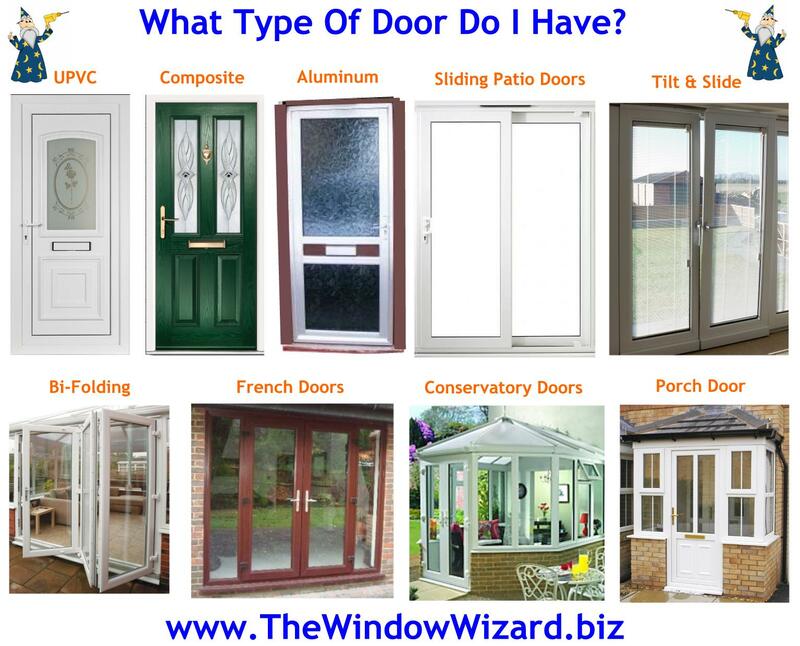 How do I know if I have an Aluminium (metal) or UPVC (plastic) or Composite door? Measure the edge of the open door. Aluminium thickness is approx 30mm-50mm and in addition tends to have a wooden sub-frame. Whereas UPVC is approx 60mm-85mm in white or brown effect. 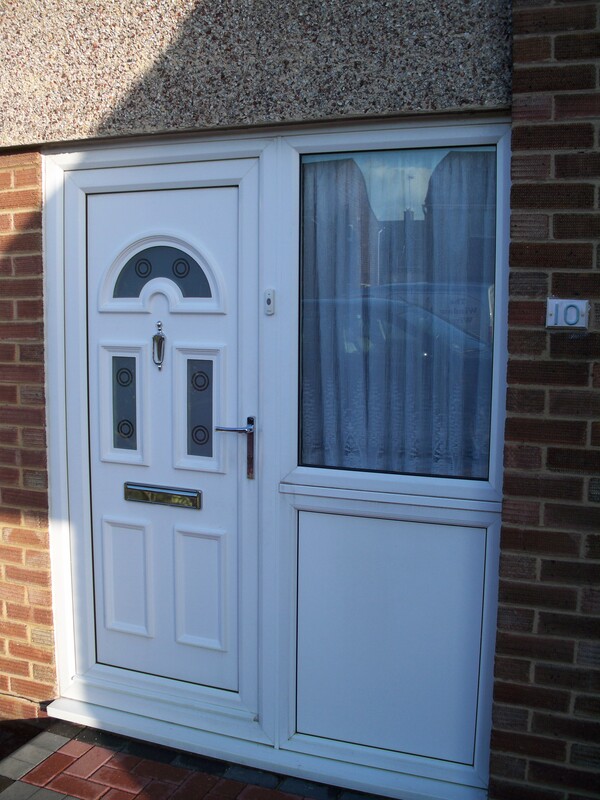 In particular Composite doors are approx 44mm thick and can be almost any colour. My door will not lock? Just a re-alignment is required if the lock works when the door is in the open position. My key turns but the handles will not move? This could be due to a jammed or broken multi lock. 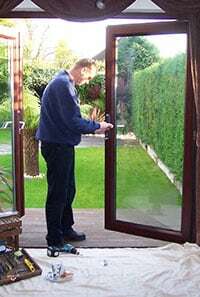 How do I know if my doors are Patio or French doors? Patio doors are on rollers sliding open. French doors are a pair of hinged opening doors. The door is really old, can it still be repaired? Most of the time yes even if the broken part is discontinued, we can use similar parts or convert it to a more modern system. My front door latch can be opened using the outside handle without the need for a key? Most likely this can be rectified by an internal lock adjustment. I can’t remove my key when the door is locked? The most likely cause is from using a key on both sides of the lock at the same time. The door handle will not lift when the door is closed? In this case it is most likely due to a misaligned door. My key turns but the handles just spin and the door will not open? This could be either a faulty set of handles or a broken locking system. 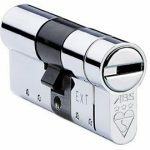 The door key is stiff to turn or difficult to insert into the lock cylinder / barrel? A common cause for this problem is lack of lubrication. Customers can try applying a little oil on the key and working in and out of the cylinder. If the key is still tight then the barrel or key might be worn or damaged and will need replacing. My door handles are loose, wobbly, floppy, stiff, notchy or broken off? This maybe either lack of lubrication, worn handles, as well as a broken springs, faulty lock etc. 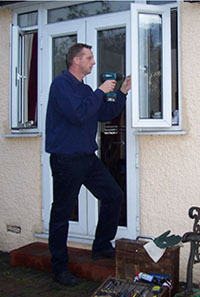 Double Glazing Repairs that are all fixable at an affordable price. Our letter box / postal flap has broken? Your telescopic letter box can be replaced to match your existing fittings. One of the hinges, have broken on my door? Most times the broken hinge can be replaced. If the door hinge is discontinued we can supply and fit a set of more modern hinges. Our door is catching at the bottom? The door has most likely dropped and requires re-aligning. My front door key won’t turn? Don’t worry, this can be due to either a damaged key, faulty cylinder, dropped door or faulty multi point lock. When I close my window there are gaps and a draft? There are two main causes for this problem, such as the hinges or rubber gasket have worn and require replacing. Our windows are really old can you still repair them? We will try our best and if the broken part is discontinued. Additionally we can usually convert your window using similar parts. However, not all windows can be converted. I have broken my key in the window lock? Initially we will try to extract the broken key, however if not we can replace your lock. My window is locked shut and I do not have the key to open it? The lock can be picked open or changed, causing no damage to the framework. I wish to lease my property but the local authorities insist that all above ground windows have child safety and fire escape hinges. 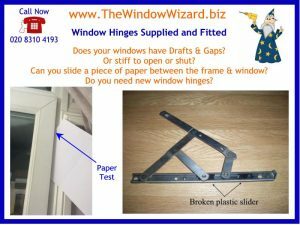 We can change your window hinges, to include fire escape and child safety catches. The handle on my window is turning but the window will not open? This maybe a result of a faulty handle or the locking mechanism broken inside the window, both parts can be repaired or replaced. My tilt and turn window is not functioning correctly? Most times this is because the window has dropped or jumped a cog inside the drive gear. This can be rectified by adjusting and re-setting the drive gear. We do NOT Replace, Renew or install any new windows or doors, therefore I will make every effort to repair your existing double glazing. Will you charge a call out fee or VAT? No, I do not charge a call-out fee and as a small family run business, I am not VAT registered. Do you give free estimates, over the phone? Definitely, if you tell us your Double Glazing problems, we can normally diagnose and supply you with a price over the phone. My window or door, is letting in water? In reality and with expert knowledge, most leaks can be easily solved. Can most repairs be completed in one visit? Yes, we carry most parts on the van and 90% of jobs are completed in one visit. My warranty has run out with either: Acorn, Anglian Home Improvements, BAC, Brampton Windows, Britrlite, Camelot, Crown, Crystal, Everest, PJ Plastics, Sutton Windows, Trade Windows, Weatherseal, Zenith or ANY other double glazing installer, do you have the parts to fix my windows or doors? 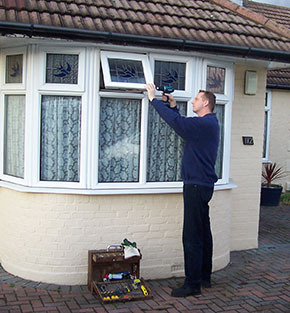 Yes certainly, we can repair almost any manufacturer / model / age of double glazed window or door. 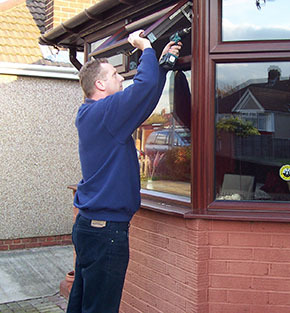 Local Double Glazing Repairs, Door Repairs, Window Repairs as well as UPVC conservatory window & door repairs Bexleyheath, Swanley, Dartford. 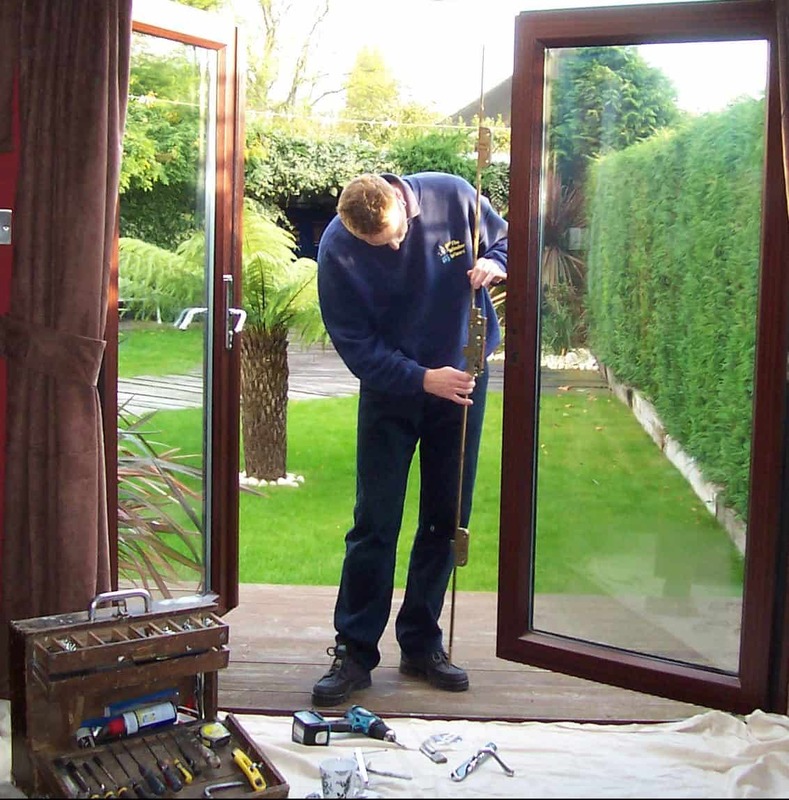 We offer upvc door repairs including patio door repair and alignments. Contact us with your questions & double glazing window and door problems. Local family run business you can trust for all your double glazing issues. We offer a REPAIR ONLY service and will not try to sell you new windows and doors.